The second day of the Iditarod Trail Invitational began under clear skies and far-reaching visibility, granting my bush pilot friend Dan Bailey and I the perfect opportunity to take his little yellow Cessna over the Iditarod Trail to spectate the race from the sky. The lead cyclists were already pedaling into Alaska Range and out of the reach of our weather window, but we were able to catch the action of the also-hotly contested foot race. The following are some photos from our fly-over. 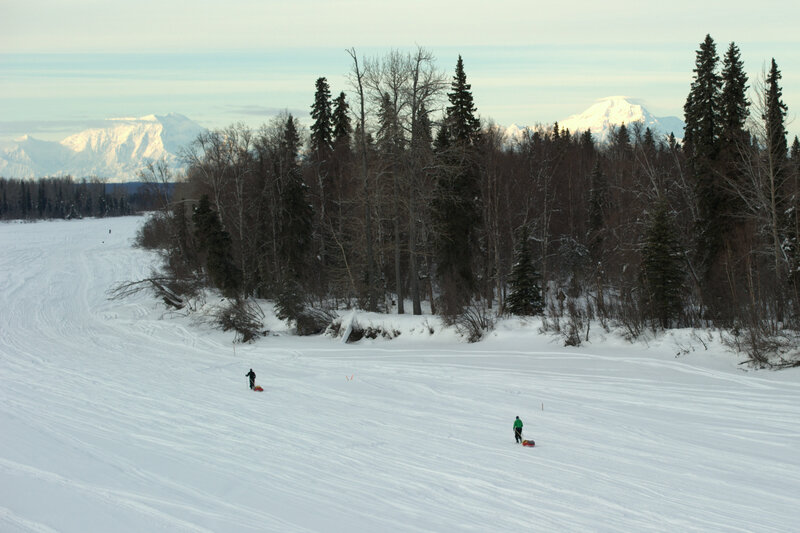 Midwestern runners John Storkamp of Minnesota and Matt Long of Wisconsin travel up the Yentna River toward Skwentna Roadhouse on Monday afternoon. Storkamp is a fixture in Minnesota’s Arrowhead 135 and was one of the favorites in the foot race this year. We chatted with him briefly in the morning before the start of the race. He said he didn’t intend to push the pace at the front of the pack, but planned to “make sure I see everything there is to see out there.” The two were in sixth and seventh position out of the mile 57 checkpoint, about four hours behind the leader. Several cyclists were also in the mix with the runners on the Yentna River. Afternoon temperatures were in the low to mid-30s and trails appeared to be punchy and soft. 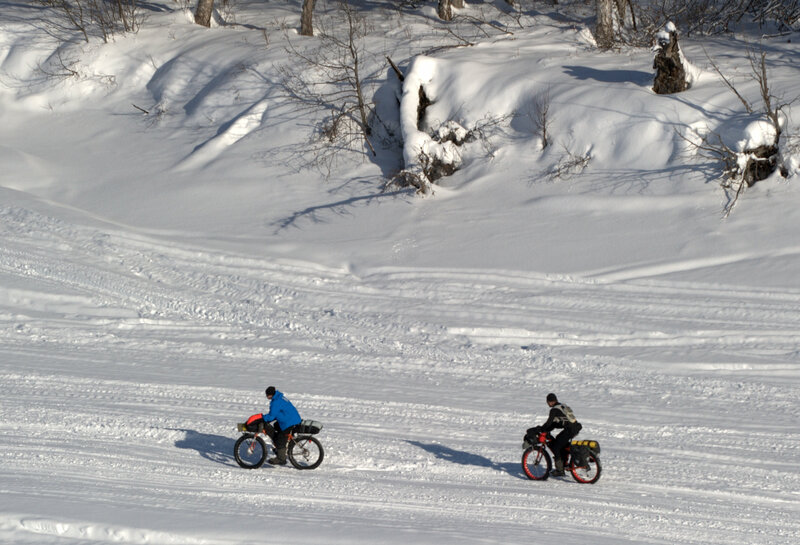 We watched several bikes swerve out of ruts and stand in their pedals as they struggled through the buttery snow. Dave Johnston of Willow, Alaska, held a running stride despite the soft snow, strengthening his lead in the foot race. 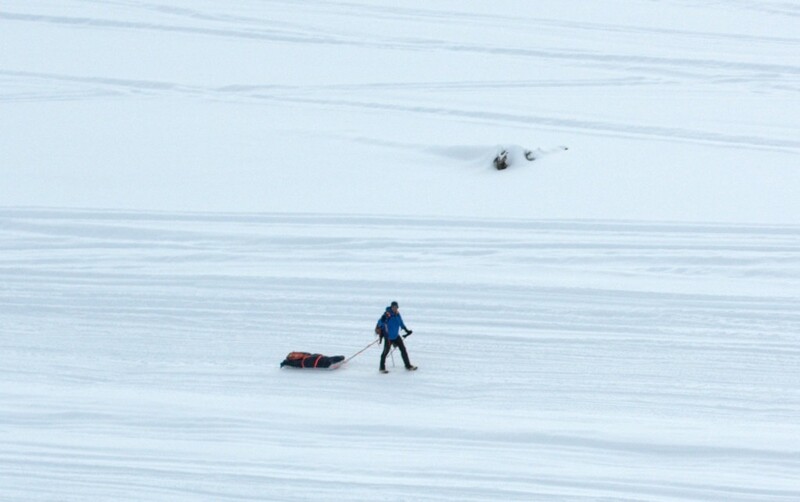 David was the first out of Yentna Station, an hour ahead of Eric Johnson of Utah. Dave’s three-foot ponytail and funny hat make him easy to spot from the sky. 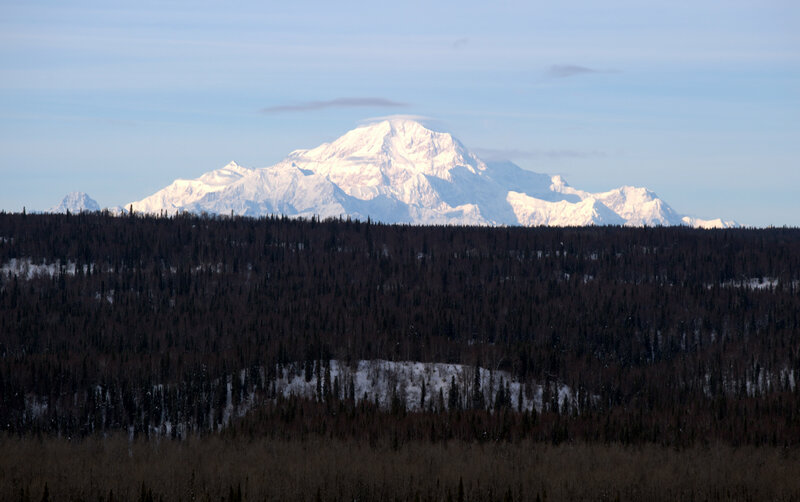 As Alaskans like to say, “the mountain was out” in full display on Monday afternoon. 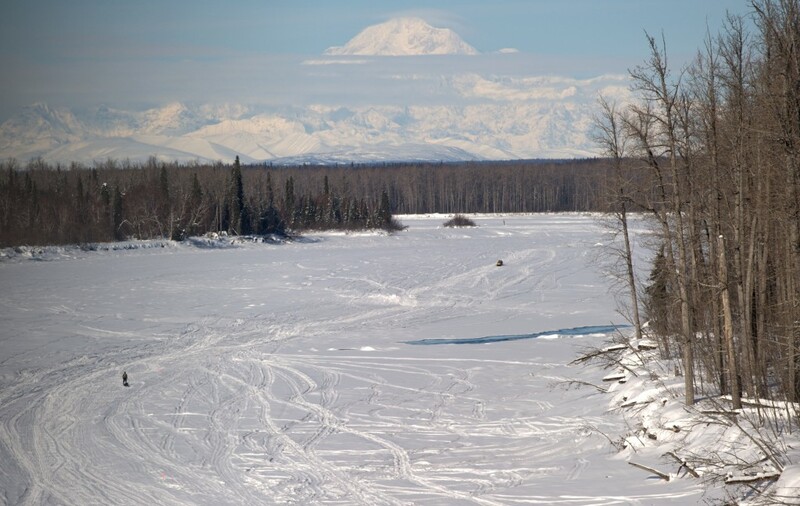 Denali is more than a hundred miles from this section of the Yentna River, but its 20,320-foot mass looms over a skyline that can only be seen on exceptionally clear days. 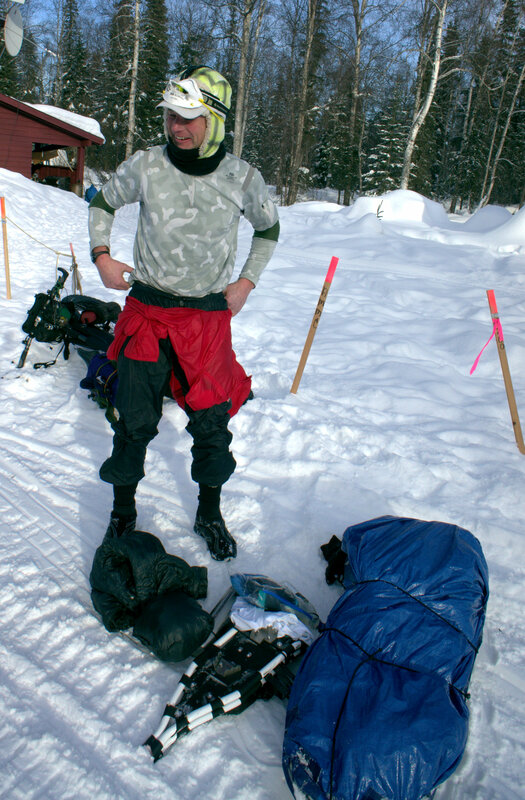 Shortly after we landed at Skwentna Roadhouse, the mile 90 checkpoint, Dave pulled in at 3:30 p.m. 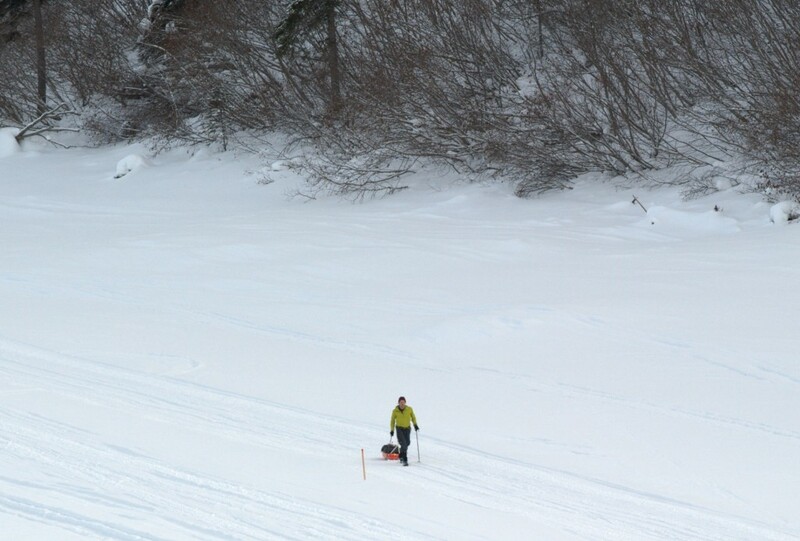 He reported that trail conditions were “bad, just bad” and said he wore his snowshoes off and on during the trek from Yentna, then opted to run through the soft snow because “it wasn’t really any harder than walking.” Although he was already more than a day ahead of his storm-affected pace from 2012, he said this year’s race has been harder than he expected. Dave likes Budweiser. 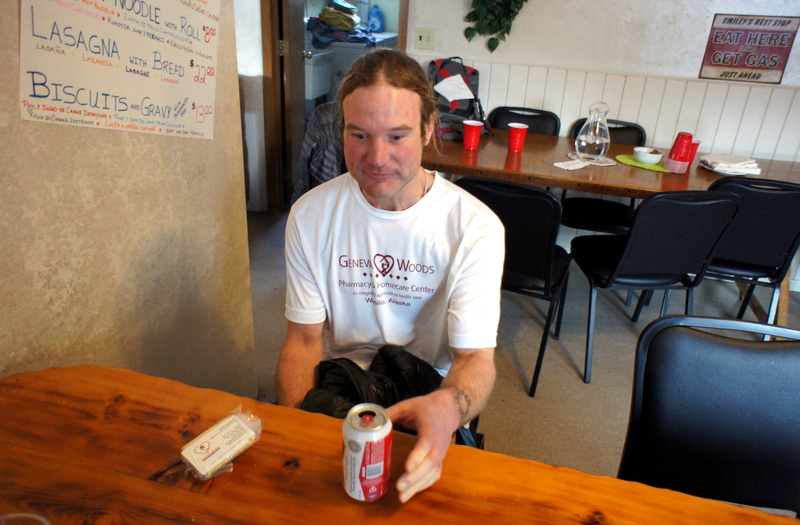 In the short time we visited with him at Skwentna Roadhouse, he guzzled three cans and inhaled a bowl of proprietor Cindy’s popular chili and cornbread. 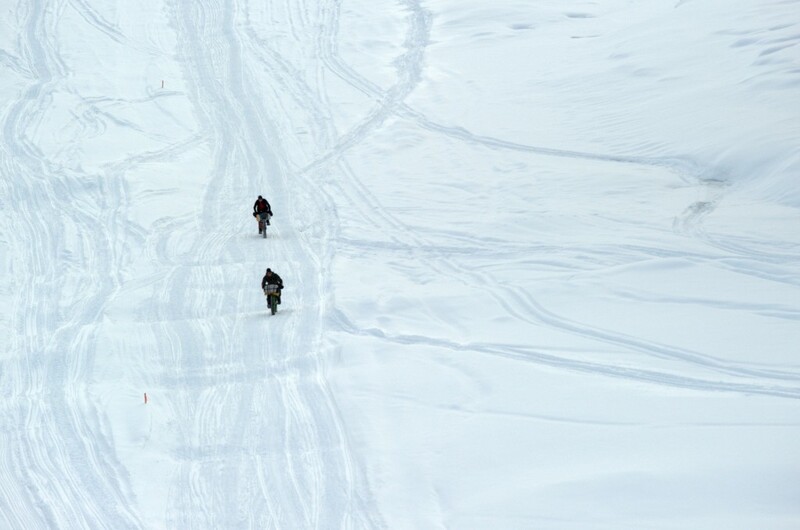 When asked if he wanted to relay a message to his wife and son, he said he missed them and promised he would stop for a better rest at Shell Lake, about eighteen miles down the trail. But he intended to bust out of Skwentna as soon as he had his fill of beer. Back in the air, we caught a glimpse of Colorado ultrarunner Joe Grant, in third position about two and a half hours behind Dave. We also saw more bikers making their way up the trail. 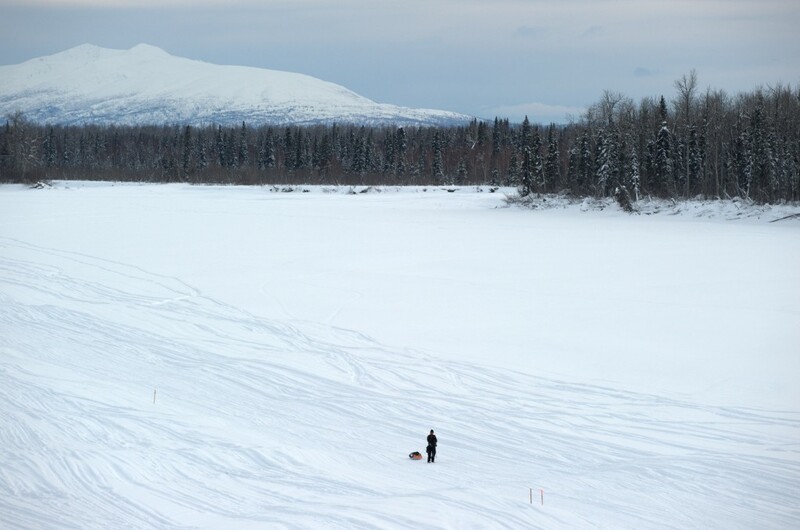 It’s been more than a week since there’s been significant snowfall on the Yentna River, and snowmachine users have created an extensive braid of tracks across the ice. I wasn’t able to identify all of the runners from the air, but the scenery surrounding them was spectacular. Nome power couple Tim and Loreen Hewitt travel toward the skyline of Mount Foraker and Denali. They appear to be sticking together for now and also seem to be in good spirits based on their enthusiastic waving at our plane. 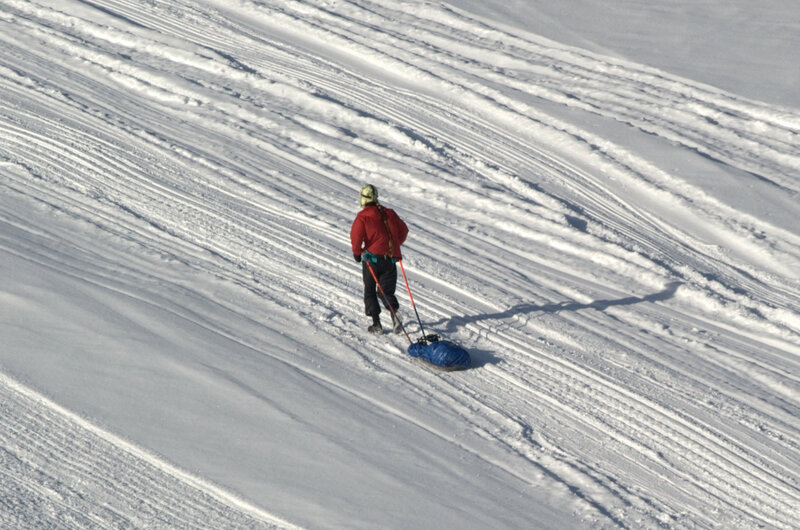 Then, about halfway between Yentna Station and Skwentna, we finally spotted Beat Jegerlehner, who was traveling with another foot racer that was possibly the Italian Marco Berni, who checked out of Yentna Station with Beat at 1:35. Even from a hundred feet up, Beat’s smile was distinguishable and infectious. 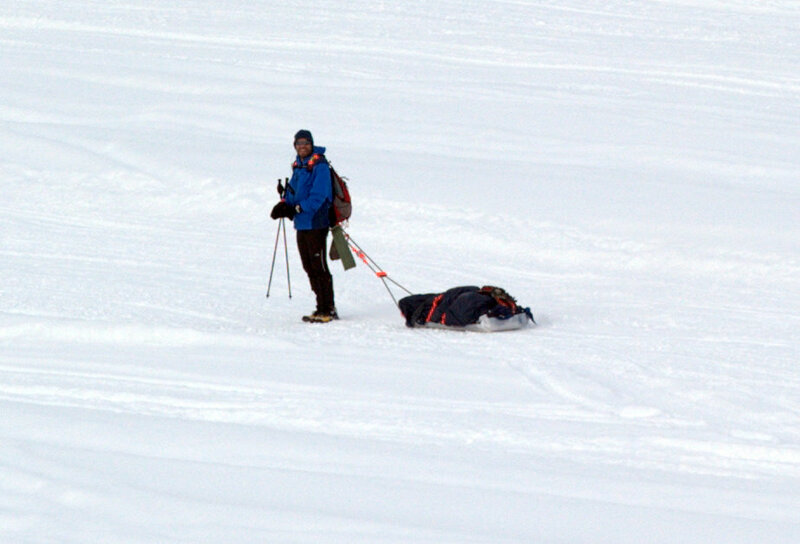 He’s reported fatigue and difficulties but seems to be enjoying the trek up the river. The bike race is still closely contested with a pack of six pushing the pace up front. 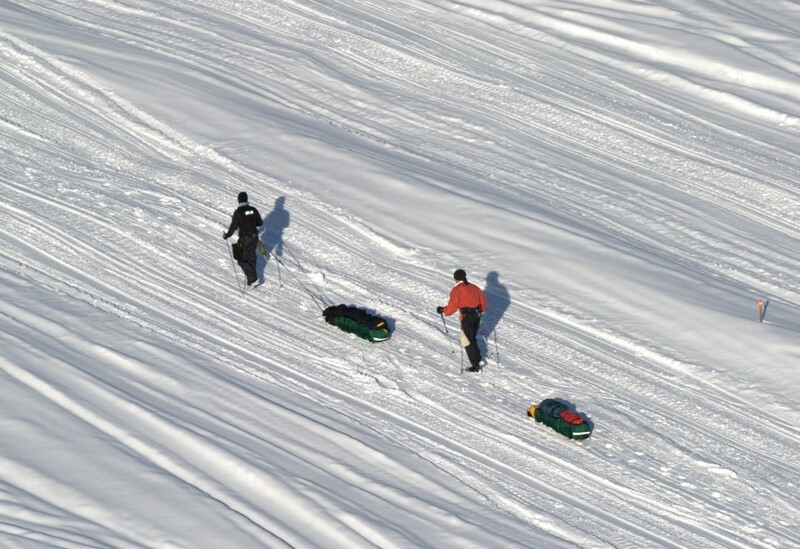 They left Winterlake Lodge, mile 135, at 4 p.m. Monday, with 38 hours on the race clock. Lead woman Eszter Horanyi is just over four hours behind the lead men. The most recent update of the leaderboard can be viewed at this link. Love that you did the “Flyover” again this year. I look forward to following the long journey to McGrath and Nome with these amazing adventurers. 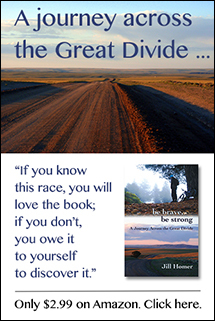 Thanks you, Jill, for reporting and posting and supplying news! And great fotos! We enjoy all of it!